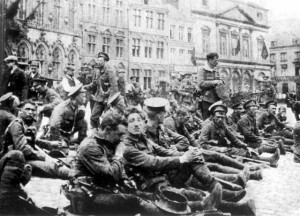 British troops rest the day before the battle. The Angels of Mons is a First World War legend about a band of angels who supposedly protected British troops at the Battle of Mons on 22nd – 23rd August 1914 – the first battle fought by troops of the British Expeditionary Force sent to defend Belgium. The advancing German divisions were thrown back by heavily outnumbered British forces, who sustained heavy casualties. On 23rd August, however, the British were forced into a retreat. Not only was the battle of Mons a shock to the British troops, it was also an ominous harbinger of what was to come. It began to dawn on British civilians that the war would not be over by Christmas and that the price of victory would be bloody. On 9th September, a journalist named Arthur Machen published a story, “The Bowman” in the London Evening News, inspired by an account he had heard of the heroic resistance of British troops at Mons. The story described phantom bowmen from Agincourt, summoned by troops who shot down the German attackers. The story was written from the perspective of an eye-witness to the engagement. Readers asked for evidence but Machen had none and said so, as he had no wish to perpetuate a hoax. However, with the imposition of tight censorship of news, the story persisted. Parish magazines published the story and a priest did so in pamphlet form. Machen made it quite clear he had no proof that the story was true, but the priest simply replied that he must have been mistaken. By April 1915, variations of the story had begun to circulate as authentic fact, including an account of German corpses being found with arrow wounds. The “Occult Review” published an account by an eye witness who claimed to have seen “a row of shining beings” between British and German lines – hence the Angels of Mons. Rumours increased with the “Spiritualist Magazine” elaborating on the original version. Factual reports of German atrocities in Belgium fuelled the belief that God was on the side of the Allies and would therefore quite naturally intervene to aid the British. It was even suggested that the story was a deliberate propaganda ploy by military intelligence to boost morale and spread disaffection amongst the enemy. With the sinking of the Lusitania and the Zeppelin raids, civilian morale was not good. The war was not going well for Britain. Perhaps the most bizarre twist was an article in The Sunday Times (in 2001) claiming that photographic evidence had been found and that Marlon Brando had acquired film footage and planned to make a film. Needless to say, no such evidence existed. There are a number of fairly simple explanations for the persistence of the story. Belief in the occult and spiritualism was common amongst the Edwardian middle class – Arthur Conan Doyle and Rudyard Kipling both believed in ghosts, fairies and communication with the dead. Further, church attendance had declined before the war, and clergy hoped the story would revive their congregations; because in times of communal stress, myth is a powerful weapon of survival. It’s Never too late to Study!